So, I was really excited about this. 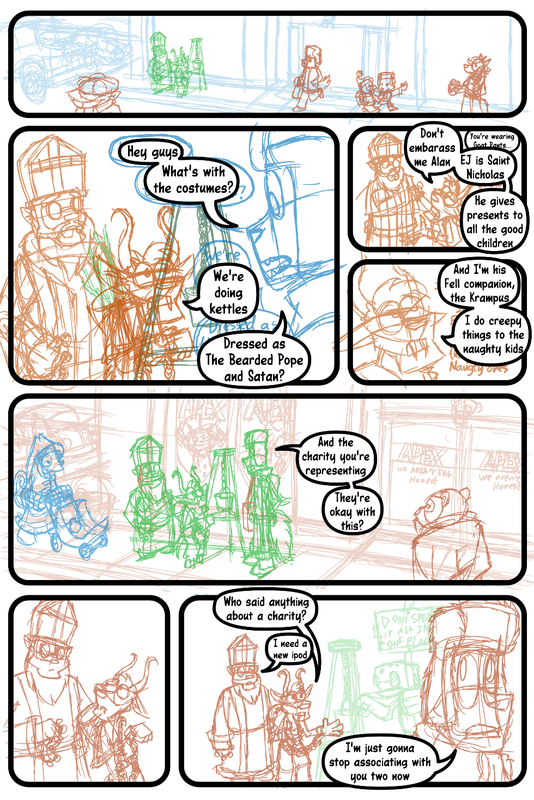 I was going to have this comic up for Christmas, AND make my immediate family board games, AND have time left over to do sketches for my artist friends. Then stuff happened involving death and leaving town unexpectedly. And while I packed my tablet, I forgot my stylus at home. But I figured I could still make this work. so I sat up for three hours after I should have been asleep, doing line art with the Bézier Curve Tool in Inkscape. But then Inkscape decided to have one of it’s famous tantrums when I was too tired to remember to save regularly. So that happened and I lost most of my work. So you get the sketch and maybe I’ll have it inked by NEXT December 25. So, I was trying to be super professional and stuff, but as it turns out I’m just as much of a hack as ever. Forgetting my stylus means I’ll be a week late for starting updating again too, since we’ll be away ’till January 2nd. And as good as my intentions were, I didn’t get my buffer done like I wanted.